Taste of the Market Coming March 25! Farmers’ Markets offer a unique opportunity to connect people with the farmers that grow their food. And food is the ultimate ‘connector’ of new neighbors and friends.  The Sunday Farmers’ Market at College View wants to strengthen those connections in new and exciting ways in 2018. To start the season, we’re hosting a ‘Taste of the Market’ reception March 25th, 2:00-4:00pm, at the Calvert Recreation Center (4500 Stockwell St, Lincoln, NE). Neighborhood residents and businesses, as well as all market supporters, are invited to stop by and experience the incredible diversity of flavor the market offers. Bakers and concessionaires will have samples of their products. Local chefs will use ingredients from dozens of the market’s farmer members to create simple and extraordinary sample dishes. Market farmers will be on hand to answer questions about fruit and vegetable seasons, as well as meat, dairy, cheese, honey, and specialty items. The Market Manager will be available to share about the upcoming season plans, and ready to hear your ideas, too. SNAP representatives will join to discuss using SNAP benefits at the market and how to take advantage of Double Up Food Bucks, a program that matches up to $20 in free fruit and veggie coupons for SNAP recipients. Stop by for 10 minutes or stay for 60 minutes... join us as we celebrate the start of a new market season!